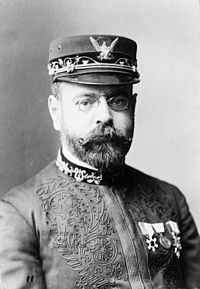 While the composer of iconic marches is famous for directing the U.S. Marine Band and his own world-famous ensembles, John Philip Sousa’s early life as a violin prodigy is relatively unknown. A sickly child, Sousa was home-schooled, and from the age of six his studies included lessons with an Italian violin teacher. He showed tremendous promise, and his father, a trombonist in the Marine Band, enlisted him as a Marine apprentice when he was 13; there he studied academics and several instruments. Sousa went on to play the violin in orchestras and chamber groups, where he developed a taste for cutting-edge art music that he never lost; for example, his band performed excerpts from Wagner’s Die Meistersinger ten years before the opera’s first U.S. production. This according to “John Philip Sousa’s violin: An American original” by Erin Shrader (Strings XXV/4:187 [November 2010] pp. 53–56). 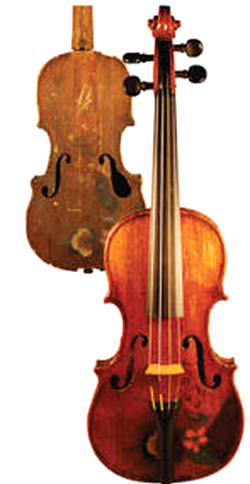 Above, Sousa’s childhood violin before (background) and after it was restored by John Montgomery. Below, Sousa’s Band performs Carl Friedemann’s Slavonic rhapsody.